I was given a cookbook yesterday by a dear friend (thanks Bri!) and couldn’t wait to try it out. It’s Nestle Classic Recipes, and these bars just had to be made immediately. I love white chocolate. There aren’t nearly enough recipes out there that include it. This one paired it with two other amazing flavors. Raspberry and almond. Yuuuuuum! I was particularly interested in the “grease and sugar” instructions for the pan. I’ve never seen that before. Worked great. The sugar blended with the buttery crust and gave it a nice sweet crunch on the exterior of these bars. Also intriguing to me was the lack of baking powder or baking soda in the recipe. I wasn’t sure how that was going to turn out, but the results were fantastic. 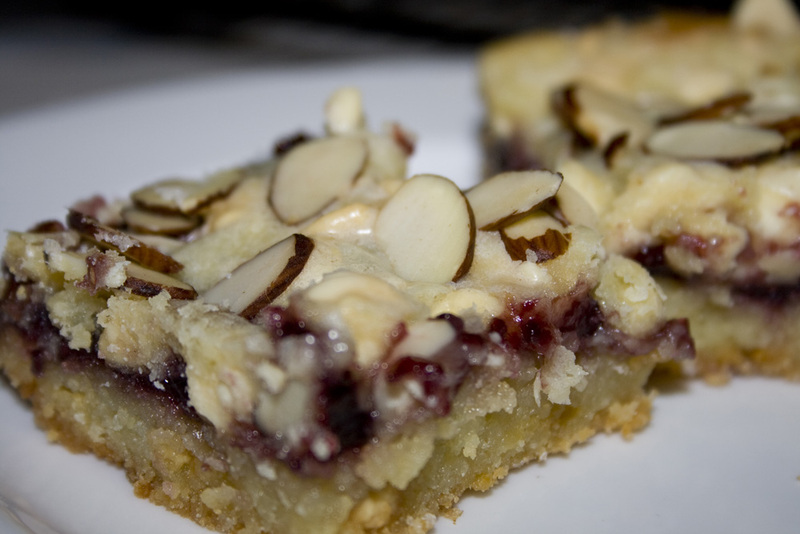 A not-at-all-cakey, sweet and buttery almond bar with hints of jam just poking thru the top white chocolate layer. Delicious! Preheat oven to 325 degrees F. Grease and sugar (yes, sugar not flour) a 9-inch square baking pan. Melt butter in a medium, microwave-safe bowl on high power for 1 minute; stir. Add 1 cup white chocolate chips, let stand. Do not stir. Beat eggs in large mixer bowl until foamy. Add sugar; beat until light lemon colored, about 5 minutes. Stir in chocolate/butter mixture. Add flour, salt and almond extract; mix at low speed until combined. Spread 2/3 of the batter into the prepared pan. Bake 16-19 minutes or until light golden brown around edges. Remove from oven and place on a wire rack. Heat jam in small, microwave safe bowl on high for 30 seconds until easily spreadable. Spread jam over warm crust. Stir remaining 1 cup chocolate chips into remaining batter. Drop spoonfuls of batter over jam. Sprinkle with almonds. Bake for 25-30 minutes or until edges are browned. Cool completely in pan on wire rack. Cut into bars. Hi Tonya! I made these for a brunch we had and they were wonderful just like you said! Thanks for all the great recipes. You are so welcome! I’m glad you enjoyed these!